A concealed carry belt will help you out tremendously with keeping your holster out of the way. We’ve compiled this list of belts to help you choose one that’s going to work for you. We’ve got all kinds on this list to give you the best chance of finding the one you’ll love. Before we get started looking at the belts, let’s take a look at some of the things that you should know while you’re shopping. Material: What is the belt made of? There are two options, really: nylon, which is flexible and can carry a lot of gear, and leather, which is sometimes sturdier and feels more comfortable. It’s a personal choice, but an important one. Color: There are a few different colors that these belts can come in. Leather belts can come in essentially any natural leather color, while nylon belts are pretty much just black. Choose the color that you like the best. Width: How wide is the belt? This is important because it tells you if your gun holster is going to fit on the belt. Sometimes, holsters have smaller or larger loops or paddles. Know the proper size before you order. Size Range: This refers to the waist size. 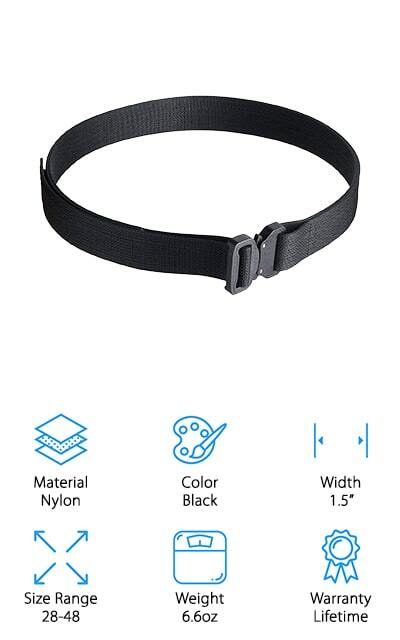 Some of these belts have additional instructions for measuring exactly what size you’ll need, but for the most part, you’re going to want to base it on the size of your pants. Weight: How much does the belt weight? Heavier belts are sturdier, but they also might feel uncomfortable or weigh you down. Go with the weight that you want, but keep in mind how it’s going to feel. Warranty: Most of these belts come with a warranty, which means that if something goes wrong or it breaks before this time period is up, you can get a replacement belt at no additional cost. It’s insurance against manufacturing errors. Now we can get to our concealed carry belt reviews! With all of the information above, you can make an informed decision about the type of belt that’s going to work best for your carry style. The top pick and budget pick are the highlights of our list and represent the range of belts available. Be sure to check out the rest of the list for more amazing belts for your concealed carry weapon. The best concealed carry belt that we found was this one by Relentless Tactical. It’s made of entirely genuinely leather. It will be able to hold all of the gear that you carry with you without weakening under the weight. You can use it every day because it’s discreet and stylish as well. It’s 1.5 inches thick and only weighs 14 ounces. It will hold your gun right where you need it. You can use it with an inner waistband or outer waistband holster, and it can carry additional flashlights and ammo as well with the right pouches. This made the top of our list because it can easily go for both a concealed carry and open carry belt. You can use it however you want, and you’re definitely going to like it. Plus, it comes with a lifetime warranty in case something goes wrong! We love that this belt won’t stretch or sag on you. This concealed carry belt by Mission Elite is sturdy and strong. 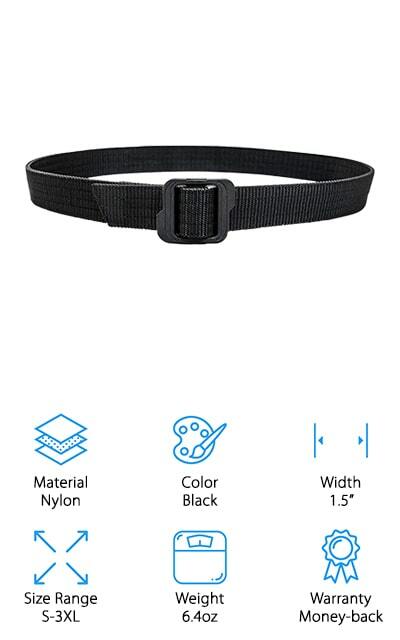 It’s a nylon belt that’s been reinforced in order to make it more rigid and tough, even if the most challenging of situations. We love how strong it is! Plus, it’s thicker than belts from competitors. It’s also got a few features that might make you love it as we do. It’s lightweight and has no metal in the buckle, which means that you will hardly be able to feel it. 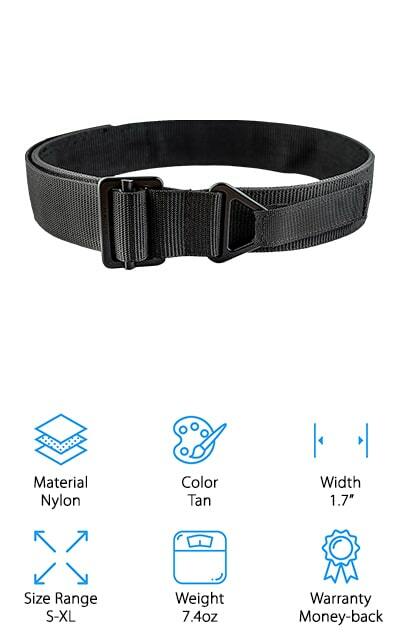 It’s a great everyday belt, great for survival gear while backpacking and other tactical situations. It’s adjustable infinitely because the nylon allows to you adjust the belt right where you need it. Need more room for more gear? It’s not an issue with this belt! It won’t ever loosen or sag and you can wear it through airport security without having to take it off! The affordable price is just a perk in addition to these features! Hanks Gunner makes this leather concealed carry belt that’s thicker and more durable than your average belt. It’s tough as well, so it will hold all of your gear without breaking a sweat. In addition, it’s an affordable price that you won’t mind paying. 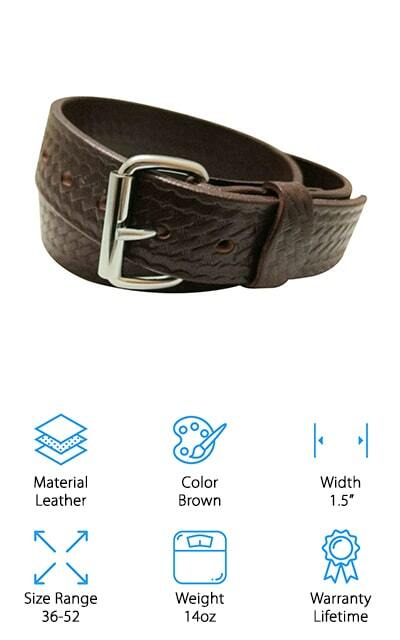 This tough leather belt is a must-have for any concealed carriers! It’s 1.5 inches wide and 14 ounces in weight, so it’s lightweight as well as being thick. It won’t roll or stretch on you, either. The buckle is removable, and instead of snaps, it’s fastened to the belt with Chicago Screws. This allows the buckle to be changed really easily, which is just another perk to this belt. Like displaying a trophy buckle? You can do that with this concealed carry belt. There are no snaps that might break either, so you don’t have to worry about that. It’s a good anchor to hold your holster and get to your gun. The nylon Rigger’s Belt by WOLF TACTICAL is a thick, high-quality belt. It’s reinforced with two layers of stiffened nylon webbing. It might just last you forever! 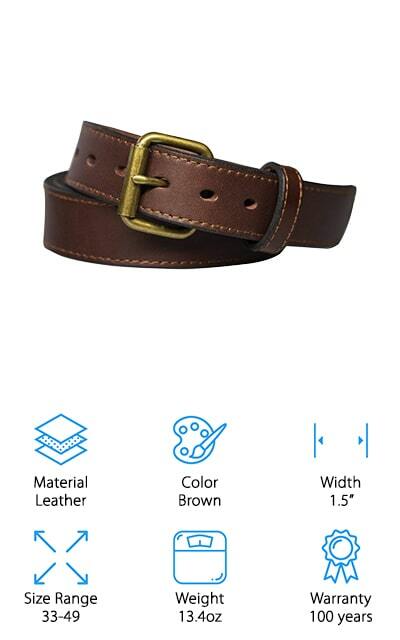 It’s built to military specifications, so you know you’re getting the best and most efficient belt. The metal buckle is boasted as unbreakable. But despite all of these things, the belt is still comfortable and you can still wear it daily. The nylon allows you to freely adjust your belt without adding holes, so you can customize how much you get to carry on you at all times. We love this feature on nylon belts. It’s a bend-resistant belt that is tough enough for all of your gear. It’s 1.75 inches wide, perfect for a wide range of pouches and holsters. It’s everything you could want in a sturdy belt for concealed carry. Use it as much as you’d like without fear of it breaking, bending, or being misshapen. 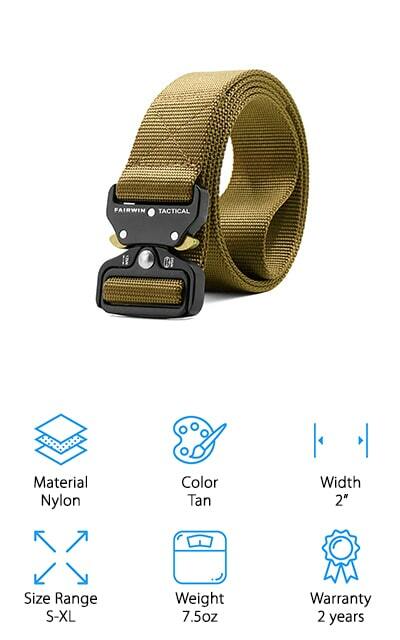 Fairwin makes this Tactical nylon belt that comes in a variety of sizes. It has a fair-sized belt that’s actually really stylish! It’s a military-style buckle made from heavy metals. It won’t break or be damaged easily, which is great. If you need to get the belt off, it has a quick-release function where you can access the buckle and remove the belt as quickly as possible. You have to hold both golden tabs together to get it to unlock. We love that the belt is made of environmentally friendly materials, namely 1000 D nylon. This type of nylon is thicker, more high-quality, and won’t rip easily. This type of material is used for a lot of tactical and survival gear. If something goes wrong with the belt, it’s covered for two years past the purchase date. We love the number of different lengths you can get. Each belt is thick and sturdy, with a great, comfortable fit! One of the best leather belts for concealed carry is this one by XTAC. It’s made of nylon that has been reinforced and stiffened so that it doesn’t sag or bend. It’s great for any holster, ones that go in the waistband and ones that stay outside of it. There are two layers of nylon webbing in this belt to add to the rigidity and make sure it’s the toughest it can be. You won’t have to worry about running out of adjustment holes, because you can place the buckle anywhere on this belt to secure it. Plus, the metal buckle has a quick-release function that is much like a seat belt, but it’s strong enough to stay closed when you need it to. This belt comes in a variety of sizes that will keep you happy for years to come. Carry all of the gear that you need with this fantastic belt by XTAC. Blue Alpha Gear makes the COBRA belt, a double-layer of nylon webbing that can easily carry everything that you need to take with you. It’s great for survivalists and professionals alike because of its durability and comfort. You won’t find a nylon belt that’s more rigid than this one! Still, you will hardly feel that it’s on. That’s amazing! The nylon won’t stretch. It’s got a sturdy buckle that will definitely hold for you, as well as built-in adjustment. Even within the size range that you choose, there are adjustments to be made for your perfect fit! There’s hook-and-loop closure that helps to lock the belt in place and keep it the size that you need it without loosening over time. 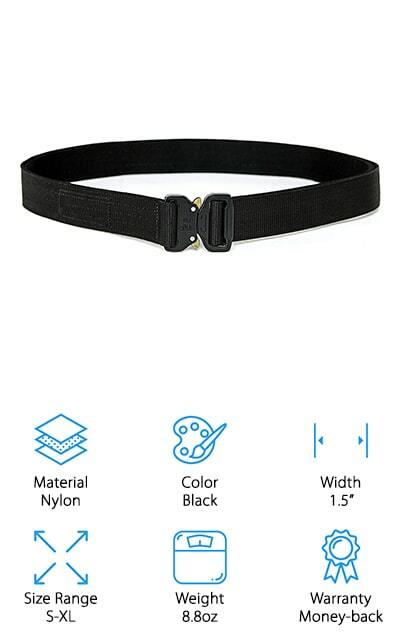 If leather isn’t for you and you want a nice, reliable nylon belt, definitely give the COBRA belt a try! The only thing that isn’t made in the US is the buckle. Otherwise, it’s patriotic! If you’re looking for the toughest, most masculine, and best leather belt for concealed carry, this is it. GritGuts makes this tough leather belt that you can use when you’re carrying your piece and when you aren’t. It’s comfortable and you won’t even want to take it off! Plus, it’s thicker than the average belt, made of bull hide leather, and it won’t sag or break under even the heaviest loads. You can carry any size pistol and all of the gear that you need for it without worrying about the load this belt can take. It works with inner waistband holsters, outside waistband holsters, and even open carry. There’s nothing that this belt can’t handle. It’s a high-quality belt that can handle anything and everything that you can throw at it, and it comes with a high-quality box to keep it in as well! It doesn’t get much better than this amazing leather belt by GritGuts. If you’re looking for an unusual belt that’s also a good belt for concealed carry, the DTOM Buffalo belt is for you. It’s made of buffalo leather rather than cow leather, which is unique. It also makes the leather a little bit tougher than it would be otherwise. It’s a solid piece of leather, and won’t ever split or sag. 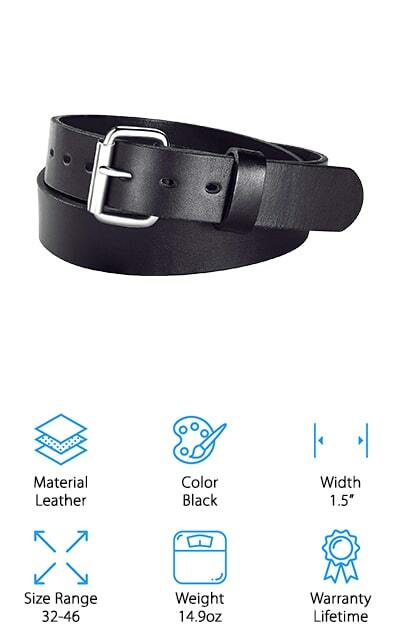 It’s a high-quality belt that will last you forever! It has a removable buckle that’s secured with screws instead of snaps, so it’s easy to change and it won’t break on you. It weighs 14 ounces and 1.5-inches wide, which is perfect for all of your gear. This belt is tough all the way around and will hold up to everything you want to use it for. It’s reasonably affordable and will hold all of your gear without breaking a sweat. If there’s ever something wrong with it, it has a lifetime warranty as well! This men’s concealed carry belt from Kmioc is a great go-to belt for concealed carry. 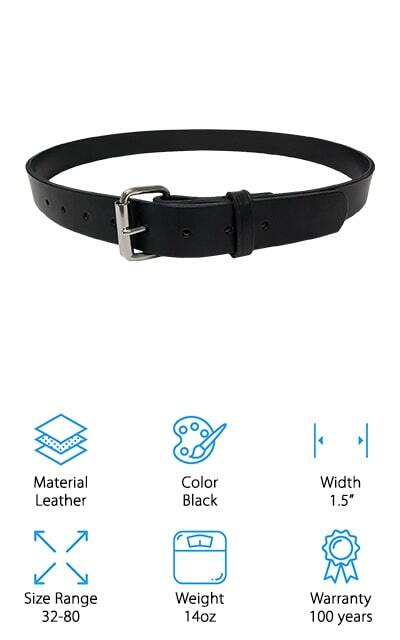 It comes in a vast range of sizes, and it even offers instructions on how to size the belt correctly for the best effect. It won’t split, sag, or stretch, which is definitely a perk that we love. The leather is full-grain and genuine, so it’s definitely durable and can stand up to anything you need it to. It will hold all of your gear and more, and it’s easy to adjust as well as being comfortable to wear. It’s thick and 1.5 inches wide, so it will fit most concealed carry belt clips. 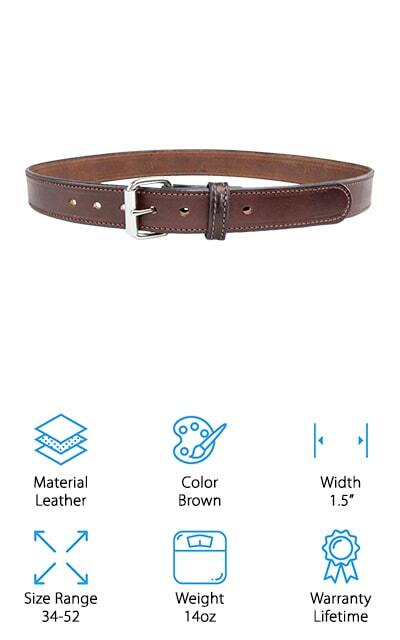 You won’t regret purchasing this belt for use every day, or on special hiking or hunting trips. It’s a single piece of leather, so there are no weak points where it can be damaged. We love that! And the super thick size makes sure that you can hold everything.